View a timeline of the Delbert Belton murder case. 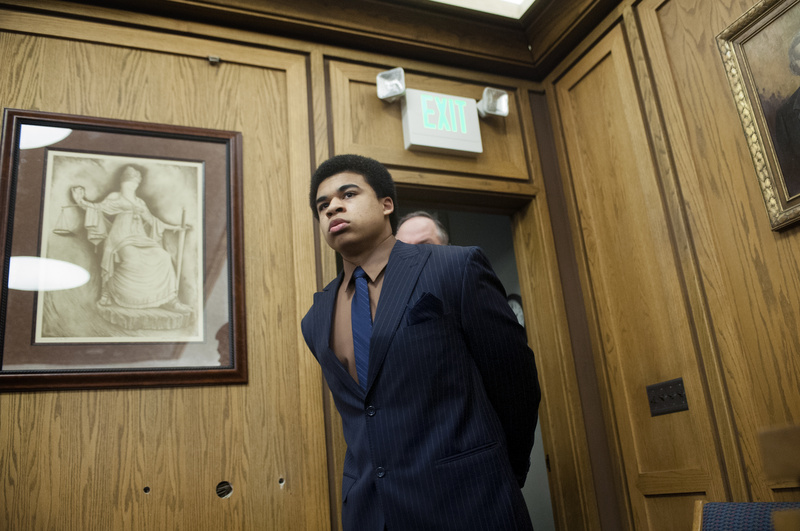 The families of a victim and his killer displayed grief, forgiveness and redemption Thursday as a Spokane judge sent 17-year-old Kenan Adams-Kinard to prison for 20 years in the beating death of World War II veteran Delbert “Shorty” Belton. The 2013 murder garnered national media attention as much for Belton’s status as a war veteran as for the racial overtones: The two teens suspected of attacking and robbing him as he sat in his parked car outside the Eagles Lodge in north Spokane are black; Belton, who later died from the beating, is white. Demetruis Glenn, the other teen accused in Belton’s death, is scheduled to stand trial in March. After the sentencing, the families shook hands in a moment of reconciliation that they hoped could help young Adams-Kinard someday lead a better life. Two of Belton’s nephews, as well as his friend, Martha Denison, spoke before the sentencing, remembering the man they knew and loved, while expressing hope that Adams-Kinard could change. Through tears, they described Belton as soft-spoken, patriotic and unfailingly kind. Nephew Steve Belton spoke about Belton’s service in Okinawa, and described him as the “patriarch” of the family – the last of his siblings left alive. “He was small in stature, but he made up for it with heart,” he said. All three credited Adams-Kinard for taking responsibility for his actions by pleading guilty. Steve Belton said he had prayed for the teen more than once, and would continue doing so. “I hope that during this whole process, when he’s done with everything he has to do, he thinks twice about ever doing this again,” Denison said. Adams-Kinard read the court a lengthy statement in which he asked for forgiveness and assured the Belton family he has grown into a better person since the night he killed Belton. He did not address the accusation made in a letter tied to Adams-Kinard claiming the 88-year-old man shorted the teen on a crack deal. Belton’s friends and family have dismissed the claim as absurd, and police said there was no evidence to support it. Adams-Kinard’s mother, Tracy Adams, pleaded for mercy from Judge Annette Plese and said anyone who knew her son would describe him as “a sweet kid with a good spirit” who loved sports and went to church. “Standing here today is a place that I never thought I’d be standing,” she said. Following the sentencing, the Belton relatives who spoke shook hands with Adams. Judge Annette Plese said it was apparent Adams-Kinard had matured since he first appeared in her courtroom. “You’re owning up and taking accountability for your actions. That’s what a man does,” she said. Two robbery charges against Adams-Kinard were dropped in exchange for his plea. He was also ordered to pay about $6,400 in fines and restitution. He will serve his time in a juvenile facility until he is 21. Because Adams-Kinard is a minor being tried as an adult, a state law mandating a 20-year minimum sentence for first-degree murder does not apply to him, which means he will also be eligible for early release due to good behavior.